I read this article and found it very interesting, thought it might be something for you. The article is called 15 Accommodations to Stay in Morocco and is located at http://trip-n-travel.com/listicle/22560/. Morocco, as the name depicts is a country whose alluring beauty is second to none. There isn’t anywhere where rarity is best displayed than in this rose-hued life-filled state found in the north of Africa. Luxuriate in exotic African dishes, warm sandy beaches and unique bewitching dances in the modern-day hotels of Morocco. To escape the crazy sagas of the ever busy African hive, comfy suites in the world-reputed cities of Marrakech and Fes await you while the awesomeness of the Great Sahara Dessert in conjunction with the Atlas Mountains, all long for your arrival. A few suggestions of the recommended ones is summarized below. Barely quarter-an-hour from the ever-accessed Medina of Marrakech airport is the lustrous Hotel Eden Andalou Aquapark & Spa. This magnificent hotel also faces the tourist-bound Atlas Mountains of the north. The Select 249 suites, more than six captivating Riads and surrounding mesmerizing flowered patios run the two unique shows; the Andalusian and the Oriental. A stretched Andalusian Esplanade faces the beautiful garden and two prime pools; one that’s heated in winter (the Majorelle) and the white pool which has fancies all around it. Bars are in plenty, restaurants resides around the Esplanade and for those who want to give a treat, the Jazz Bar and Lounge does the trick after eleven. Oh, Free Wi-Fi is available all over the vicinity and inside the rooms as well. A shining star as folks are used to refer to it. It comprises of 192 well-decorated large rooms situated right on the Bourgreb river banks. Being located in the heart of the state capital, Rabat, and facing two great Moroccan monuments, the mausoleum of the departed King Mohamed V and the time-honored Hassan Tower. As the experts have it, the selection of the top joints serving Italian foods such as Le Lorenzo as all found here. Besides that, the fully-resourced fitness center, the heated pool & spa, stylish air-conditioned rooms, smart satellite TV, high-speed Wi-Fi internet access and a stunning view of the entire city will probably blow your mind. Moroccan specialties are also served alongside specially made tea, decaf, and cocktails at the hotel’s bars and restaurants. This is precisely where you definitely should be, and as many have it, the place is too sweet for mere words. Les Trois Magnes stands for three kings and the name no doubt found the perfect match. Situated right at the center of the Gothic quarter of Riad Laarouss, the chic hotel is merely a few minutes’ walk from the traditional square of Jemaa El Fna. 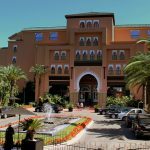 Unlike many hotels in Morocco, a dedicated taxi will pick you up from the airport and drop you right at the main gate of the hotel where the manager himself will welcome you. You can bask in the soothing sun, take a dive into the pool, or for the love birds, lavish the moment by taking things to extreme temperatures in the romantic tents with modish cushions and silk curtains in the vicinity. The Bou, a place to undisturbedly peruse through a book when tired of the cool effect of the moonlight stares you right in the face at this hotel. Five complimentary bedrooms and commendable suits will make you sleep like a baby during your stay at this Riad hotel. Much wouldn’t want to be said about this award winning North-African comfy palace. 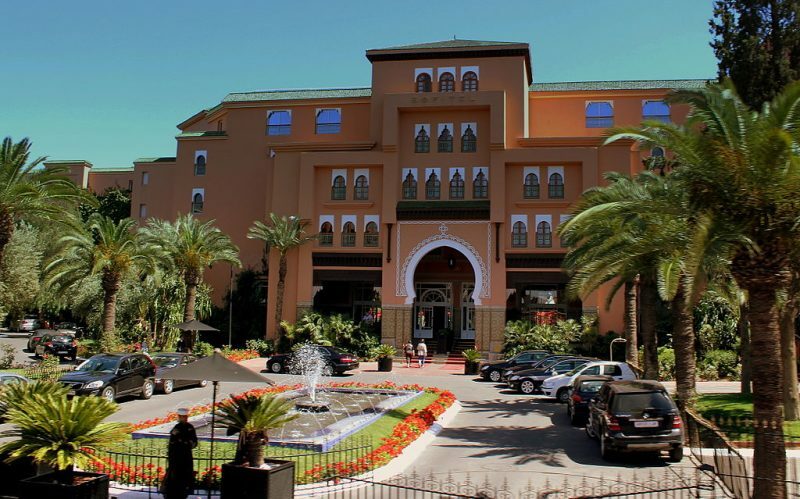 Just 5 minutes while on foot and roughly 1.9 miles from the Royal Golf Anfa sits the classic Casablanca hotel. The perplexing view of the Atlantic Ocean is quite amazing from the hotel compound. The amenities are superb with the sophisticated rooms featured with flat screen TVs, a constant Wi-Fi and a view of the ocean as well (for some rooms). A few suites have provisions for sitting room as well and upmarket restaurants, tasteful casual bistro, an outdoor pool, a cocktail bar and launching lounge are some of what you will enjoy while you luxuriate at the Club Val d’Anfa Hotel. Massages, hammam as well as Sauna will also be your acquaintance over your stay at the residence. Fret not about the parking well you get there my friend because the only word that fits it is exemplary. There are fundamentally four words that best live up to the standard of this splendid North African hotel; Luxury, confidentiality, modernity and authenticity. Savoy Le Grand Hotel is located in what can be referred to as the most distinguished locality in the entire city. This first-class hotel lets its guests enjoy the structural view of the world-famous Atlas Mountains, and its staff spread the gospel of the gracious Moroccan hospitality. The deluxe double rooms, characterized by a pool view and suite prestige (s) call for uniqueness here. The services offered extend from restaurants and bars, spas, shuttle, airport transfer, a varied early morning breakfast to select international cuisines. Wi-Fi is also in plenty and services such as laundry are also present. Well, this charming Moroccan hotel highlights all aspects of the reputed culture of Morocco. Not so many accommodation destinations can boast of the great aspects displayed here and the fact that it resides on a 7-hectare flower garden makes it super fantastic. Incorporating astounding view of the colored city and well-looked-after gardens, its rooms do have all the amenities one can dream of; satellite TVs, suave minibars, fast internet, coffeemakers, appetizing breakfast, lounge access in some rooms, extra living space, and kitchenettes, name it. Four high-caliber restaurants and upscale bars together with a 24-hour gym are also available. Outdoor pool (heated in the cold winter) also exists. The Hyatt Regency tale never ceases, so it seems. Many tend to refer to the bar service as dignified. Okay, while is that again? I tell you why. A vast majority hit the juncture for meeting agendas, but the services that meet them there, especially for those who can mumble one or two words in Moroccan redirect the motive of the visits altogether. The rates are unique, and assistance is provided when needed. The hotel has got a whole 255 dashing rooms with 223 of them being deluxe twins as well asking rooms. Café M lets you savor in a cigar or a glass of wine while the hearty music gets played at two select bar lounges. Free Wi-Fi, well-furnished elegant rooms, LCD TVs, minibars and complimentary toiletries all are provided. If you visit this part of Casablanca, then you will not have visited Morocco. Merely less than five steps from the modern Qaraouyine Mosque resides this grizzled Hotel & Spa Riad Dar Bensouda, which tells the tale of what the great Moroccan culture is all about. This typical hotel, set afloat in the 17th century has been the pillar of the efforts geared towards restoration and the opening of the doors to the long-lived architectural designs and constructions for decades now. Rich in culture, this comfy down to earth Riad hotel offers excellent accommodation services with its apartments incorporated with HD TVs, very high-speed Wi-Fi, minibars as well as operational air-conditioners. Are you an eating fan? Well, you’ve met your match then. The restaurants offer custom-designed dishes with a taste of the authentic North African swag. Want to enjoy your vacation in Morocco, Riad Dar Bensouda ought to be your best ally. The view is inarguably scenic. No one would dare blink upon gazing on it. Is it kings and queens who do stay there? I’ll tell you this; just get there and you’ll be the royalty yourself. A heated sky-themed outdoor pool, an elegant buffet, and first-class Moroccan restaurants are the least to mention at this dandy hotel. Grand Mogador Sea View & Spa has an ideal placement 5 minutes away from the accessible Tanger train station. A continental breakfast, top-notch air-conditioned suites, first-rate minibars and plausible internet throughout the entire property are some of the pleasures this cool hotel avails. With you hunger pangs taken care of, you can sweeten the stay by hitting the steam bath, the ever open fitness center, and the professionally-run Sauna. The views of the ocean and mountains are also splendiferous. For some of us with the wild feeling to explore the divine Rabat Mountains, then this is the ideal place. Set in the proximity of the ministries and embassies, this fabulous hotel found right at the center of this sovereign megalopolis, avails more than what its guest pay for. For starters, the complementary rooms feature safes, satellite TVs, reliable Wi-Fi, and minibars while lounges and hang-out bars are ever open. Hot breakfast is awesomely served and parking is also free. The staff are also incredibly humble yet excellent at their work. Oh, I forgot to tell you; they are always smiley, something that can make you extend your stay at the hotel. Simply 3-minutes stroll from the old Saadian Tombs, La Sultana Marrakech in a Riad is as well just 14 minutes away (walking) from the famous Jemaa El-Fnaa Square. The lavish, exotic suites have installed in them flat screen televisions, modernized iPod docks, non-alcoholic minibars and super-fast Wi-Fi. Private balconies are as well featured by the suites. Upgraded rooms got with them a terrace, a living room with a fireplace, a whirlpool tub, and on-alert room service. Amenities constitute a tanning solarium, a heated pool, plus a laid-back restaurant having a season rooftop terrace. A pool table, well-packed up library, a relaxing lounge, a wellness center, as well as an open-air massage palour will greet you at the luxurious hotel. 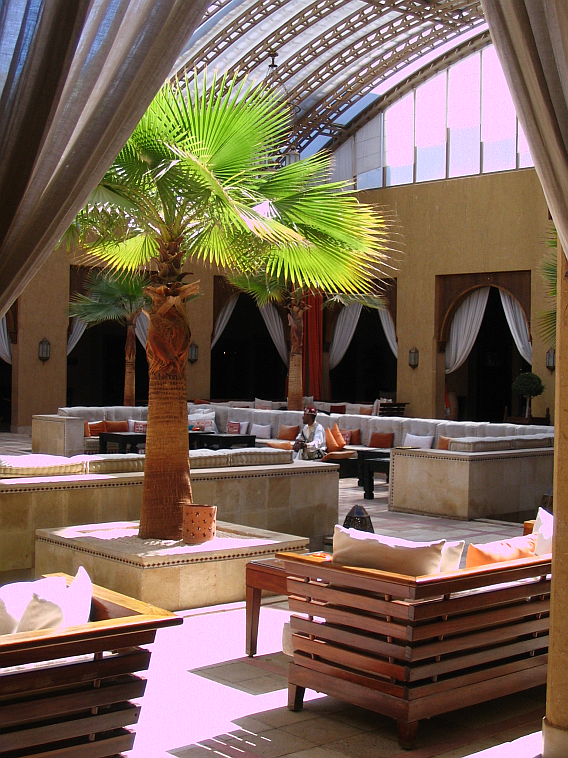 This Danish hotel is situated a few meters from the old Medina and within the CBD of Casablanca. An easy access to the vicinity is provided by both the train station at Casablanca Voyageurs and the busy Casablanca Mohamed VI Airport. Conducive conference centers and spacious meeting places with a whopping capacity of 400200 souls are also available with regulated room temperatures for extra comfort. The XO and Seven Lounge as well as the Casablanca Café do deliver an international cuisine on a 24-hour basis. As an added bonus, a free pass of a 20 dollar voucher is issued upon booking at the hotel. Amenities comprises an exclusive hotel parking, high speed internet, outdoor heat swimming pool and a splendid massage & spa palour. Riad Dar Anika, located in the accustomed Moroccan townhouse flaunts what it really means to be modish. Barely 2 miles from the conventional Majolerre gardens, this elegant hotel has all the amenities that can make your stay worth remembering including 4-poster King size beds, safes, coffee makers, non-alcoholic minibars, mini fridges and couch-filled upgraded rooms. A casual bar and a stylish restaurant specializing in various delicacies as well as a mind-calming lounge all reside as the hotel. A hammam and a rooftop terrace are extra accompaniments and massage services are also a custom norm. A select blend of the nourished Moroccan lifestyle and Andalusian splendor, the Riad Fès calls for depository as well as reflection of the gothic nature and royalty past of the state. This magnificent palatial setup boasts quite a number of rare beauties in the likes of providing a scenic view of the age-old Atlas Mountains. Fountains, steam baths, spas and massages, special smoking rooms, excellent lounges and secluded bars create a mini-world over this part of the horizon. The world of delight is further enhanced by the complimentary dining availed at the property and this surely makes it all exceptional. With shopping centers nearby and reputable tour places in the proximity, Mnar Castle Hotel Apartments takes all the credit for itself. Just think of it; bright Italian living rooms, luxurious suites availing a blinding view of the ocean and the well-trimmed exotic gardens, new single or double beds in each room, free Wi-Fi, splendiferous room service and an exclusive free parking. Would you go anywhere else? The rates are also worth it taking into account the services availed and no booking fees are imposed. Esteemed guests can also earn themselves free nights at the hotel. Have a good trip and !